The BEST Selection of Limousines & Party Buses! With legendary luxury at an unbelievable price, this vehicle is great for any small occasion! Comfortably Seats up to 3 Passengers and envelops them in style, comfort and luxury! The luxurious Chrysler 300 will ferry you to your destination in utmost style, comfort, and luxury with a most affordable price tag. Get the quiet calm luxury of a hybrid luxury car. A leather interior with plenty of room for comfort, and an affordable rate! This fine hybrid ride will give you a quiet calm experience with all the luxury you could dream of with a low price tag! A fine example of the legendary Lincoln Luxury with both style and comfort! An exquisite leather interior that sets the standard for comfort and luxury! Lincoln Town Cars are world renowned for there luxury and style, this fine vehicle is no exception. Enjoy it's comfort guaranteed to impress! Legendary Cadillac luxury is yours to enjoy for any small party! Plenty of room for 6 passengers as well as additional room for baggage! 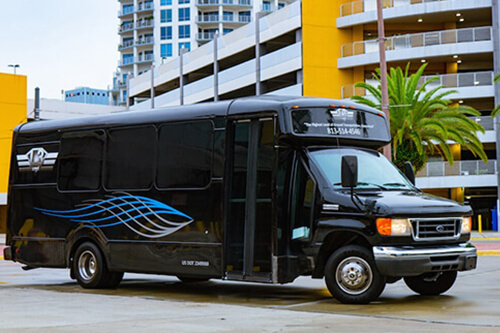 Our largest, SUV, it holds 6 people comfortably with additional room for baggage such as bags for the airport, or golf clubs for a nice golf outing! Great for transporting medium groups to and from your special event! Great for having a party right on the bus with limo style seating and party lights! Two options for this luxurious Mercedes Limo Bus. One more suited for transportation, the other, for having an amazing time right on the bus! Comfortably seats you and 19 friends in leather limo style seating! 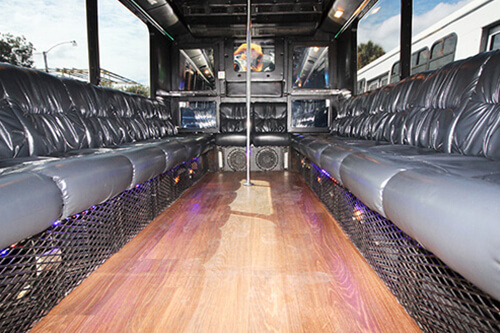 Excellent for medium parties of 20 or less,with all the luxury, comfort and fun you could hope for on a party bus! Leather seating, a bar area and an optional hostess maek you feel the luxury! Slightly larger, great for 22 people,and it even comes with a built in dance pole for you to test your dance skills on! 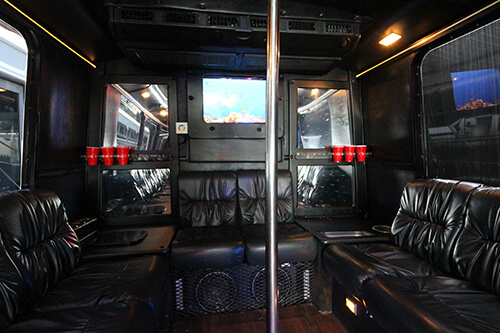 An optional hostess, a stripper pole, and a bar area really make this bus fun! 3000 Watt sound system, a 50" Flat Screen TV, Blue-ray, and aux hookups! A true work of art, this bus will have you dancing and drinking all night, for you and 31 other friends! This bus has plenty of room! 50” Flat screen TV, Blu-Ray Player, 3000 W Stereo System, and a bar! Party lights,a stripper pole, and even an optional Hostess! This club on wheels is great for all of your biggest events, with plenty of room to dance and drink all night! © Limo Tampa | www.limotampa.net | All Rights Reserved.